Buddha Purnima also called as ‘Vesak’ is one of the biggest festivals for the followers of Buddhism. This auspicious day marks the birth anniversary of Gautama Buddha, His enlightenment and death. As this day commemorates the three significant events in the life of Gautama Buddha it holds immense religious significance for followers of Buddhism sects. Buddha Purnima is observed on the ‘Purnima’ (full moon day) in the month of ‘Vaisakh’ in the traditional Hindu calendar and during the months of April-May in the Gregorian calendar. Buddha Purnima is an auspicious day even for Hindus and is observed with full devotion and dedication in whole country. In India, this day is declared to be a gazetted holiday. This day is also popularly known as ‘Buddha Jayanti’. In the northern regions of the country, Lord Buddha is believed to be the 9th avatar of Lord Vishnu (after Sri Krishna who is the 8th incarnation). However the theories slightly differ in other regions. Irrespective of the belief the day of Buddha Purnima is celebrated with same love and affection towards Gautama Buddha, all across India. Not only this, the festivities of Buddha Purnima can also be witnessed in the neighbouring countries of Nepal and Sri Lanka. On the day of Buddha Purnima, the followers of Buddhists sects visit Gautama Buddha temples. They spend their time listening to the sermons given by monks there. Some devout Buddhists spend their day visiting various temples and reciting ancient verses. Special events are held on this day in temples of Lord Buddha. A number of cultural, religious and social events are hosted in these temples. People from far and wide come to participate in these events that describe the life history of Gautama Buddha. Some temples display statues of Gautama Buddha depicting his earlier years. The statues are kept in a water filled basin and beautifully decorated with fresh flowers. Visitors who come to temple, as a part of a ritual pour water over the statues. The ceremony symbolizes a new and pure beginning. During Vesak, Buddhists devotees pay special attention on the teachings of Lord Buddha, especially the five principles called as ‘Panchsheel’. On this day some even wear white colored robes and eat pure vegetarian diet. Charity is also an integral part of Buddha Purnima celebrations. People donate food, clothes, money or any other useful goods to the poor and needy. Following the preaching’s of Lord Buddha, caged or bounded animals are set free as a display of love and affection towards all living creatures. The day of Buddha Purnima is very important for followers of Buddhism, in India as well as abroad. Gautama Buddha was a very renowned spiritual leader who denounced all the worldly pleasures to a lead a simple and contended life. He preached the principles of equality and love for all living creatures. 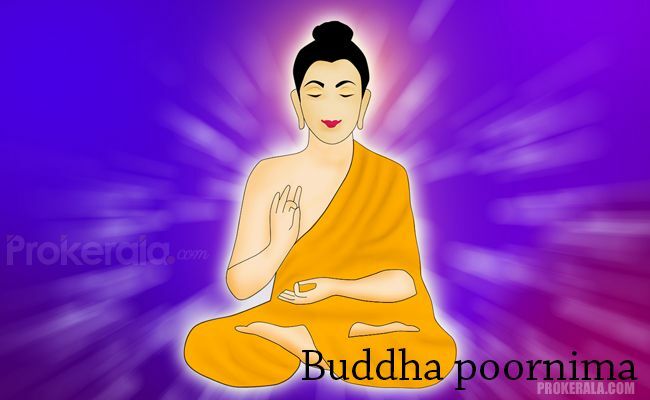 Lord Buddha is considered to be the founder of Buddhism. It is believed that the day of Buddha Purnima is thrice blessed as it celebrates the three prestigious events in the life of Gautama Buddha. On this chosen day people remember the teachings of this great saint. His teachings are used a means to end the sufferings and miseries in life.